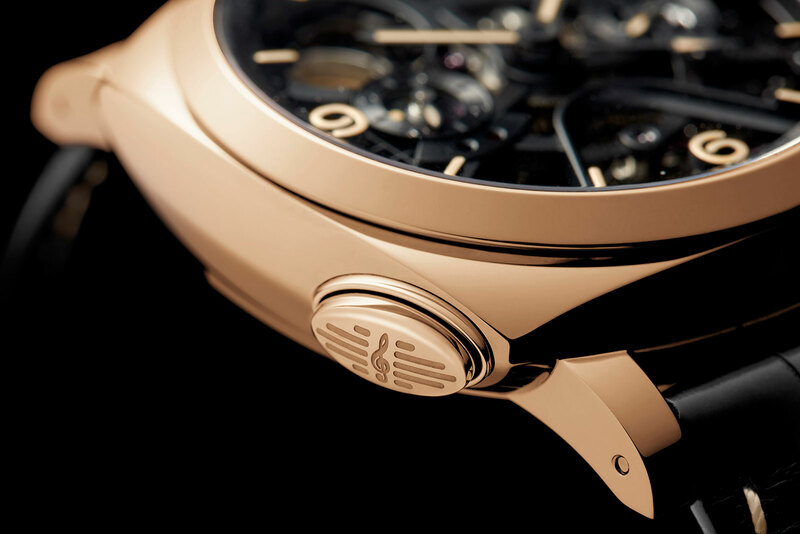 The most complicated Panerai ever, the PAM600 features a three-gong decimal repeater that can chime local or home time, plus Panerai's signature perpendicular tourbillon. Here's all you need to know, including pricing. 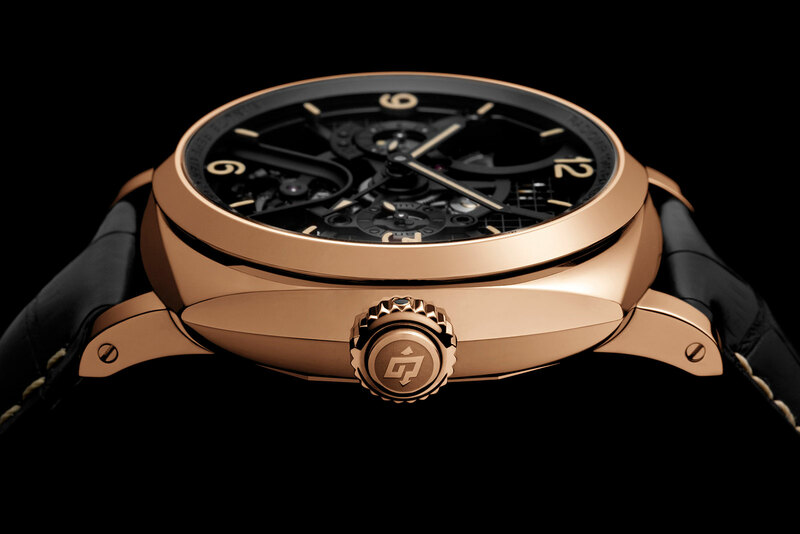 Panerai’s line-up at SIHH 2016 was conventional and modest, with lots of retro-style watches typical of the brand. 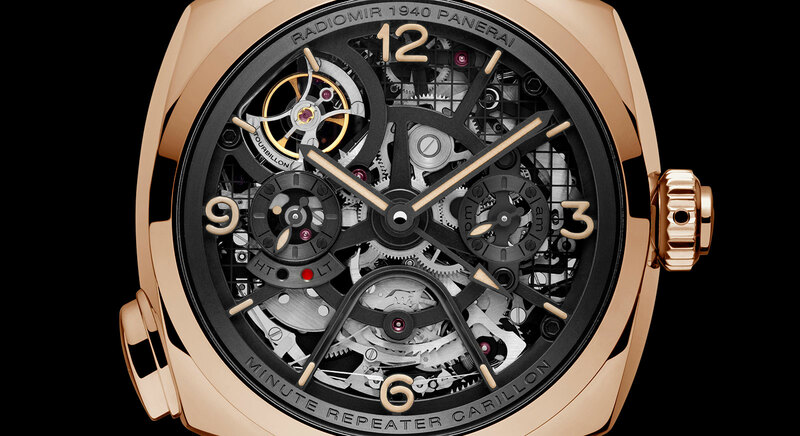 Now, three months after SIHH comes the sucker punch with the announcement of the Radiomir 1940 Minute Repeater Carillon Tourbillon GMT PAM00600. 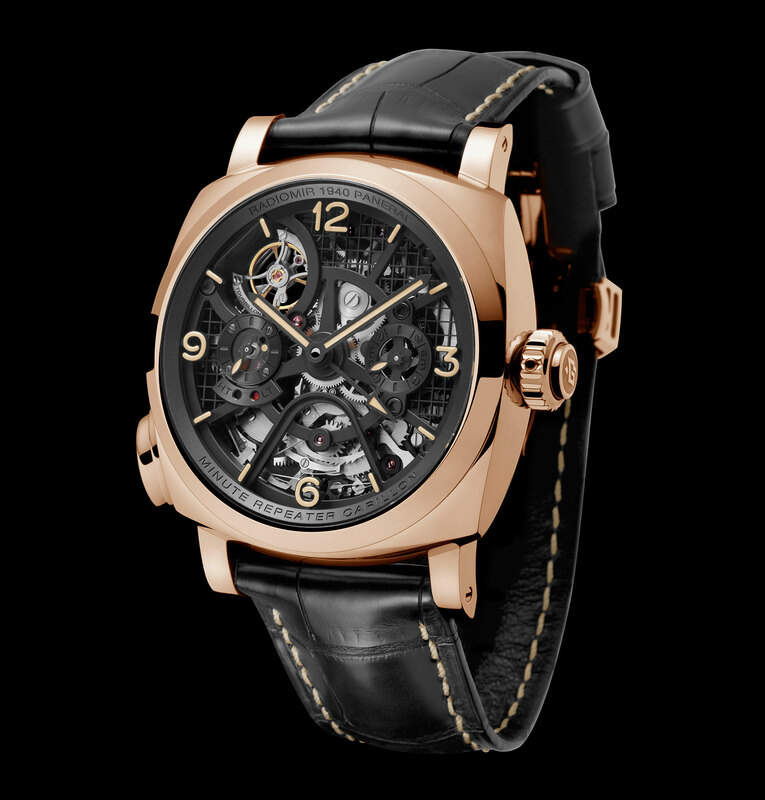 This 49 mm monster is the most complicated Panerai watch ever, possessing a decimal repeater with three gongs that can strike two different time zones as well as a tourbillon, all in all a daring and astonishing move given that the luxury watch industry has slowed considerably. Several features differentiate the Radiomir 1940 repeater from conventional repeaters. To start with it has three hammers and three gongs, one more than is typical, hence the “carillon” moniker. A button at eight o’clock activates the chimes, with the first and third gong sounding the traditional high and low notes of a repeater for hours and minutes respectively. But in between the hours and minutes, the second gong sounds a triple chime, with each triple strike representing a ten minute segment, making this a decimal repeater. This is a more intuitive manner of sounding the time as compared to the traditional chiming of quarters, and found in few other repeaters; the Voutilainen decimal repeaters being amongst them. The other unusual feature of the repeater is the second time zone striking function, a feature that’s found on only one other watch, the Louis Vuitton Escale Worldtime Minute Repeater (which is not a decimal repeater). Two time zones are shown on the hands, local time with a triangle-tipped GMT hand and home time via the main hour hand. The decimal repeater can strike either home or local time, with the crown serving as the chiming selector. A black dot on the crown on the fluting of the crown indicates it is locked; rotating the crown slightly and then pressing it switches the chiming mechanism from home to local time, and vice versa. The time selected is indicated by a red dot below the nine o’clock sub-dial, with “HT” and “LT” representing each time zone. In order to optimise the sound of the repeater, the red gold case has a hollowed out interior to minimise the mass of the case, improving sound transmission and volume; it is for this reason platinum case minute repeaters tend to sound muffled, as the case material is dense. But as the PAM00600 is made to order and customisable, the case can be in any other metal, including titanium, which should sound better. 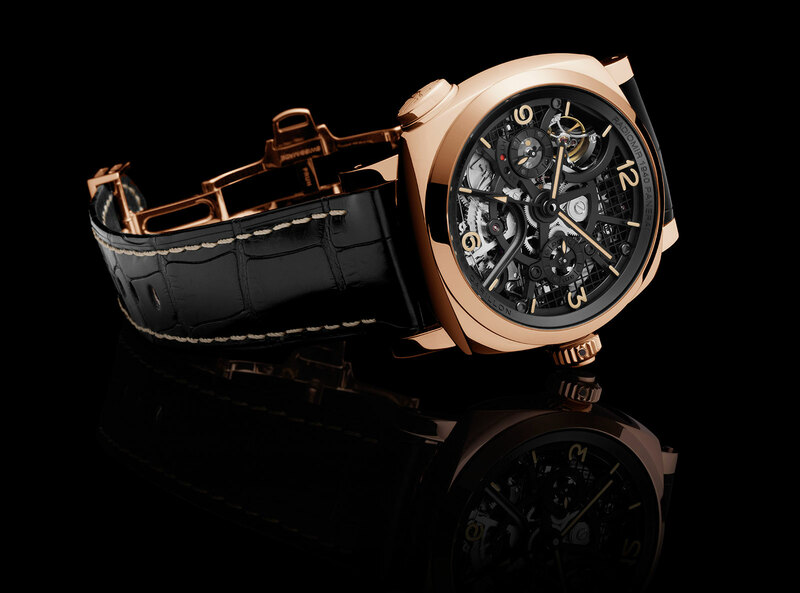 Made up of 633 parts – compare that to the 239 components of the simpler Panerai tourbillon calibre – the P.2005/MR movement inside the minute repeater is hand-wound with a four day power reserve. 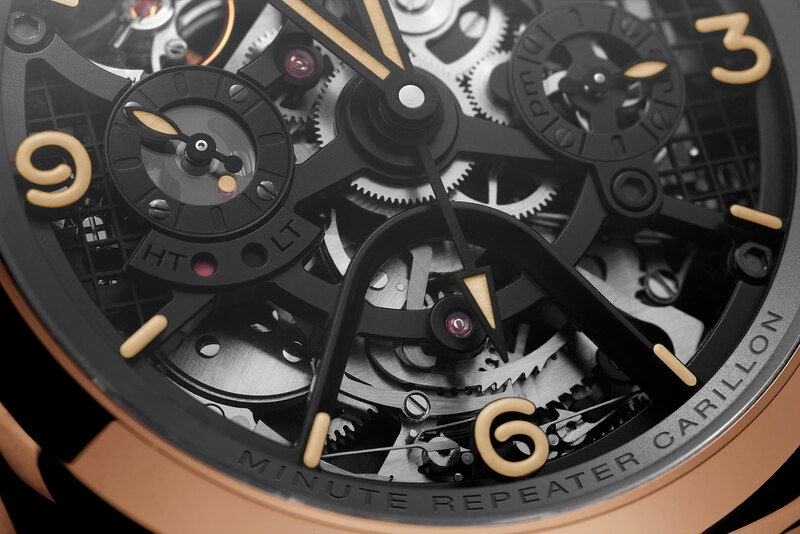 The repeater movement is partially open-worked, revealing the racks and snails of the repeater mechanism at six o’clock on the dial side. 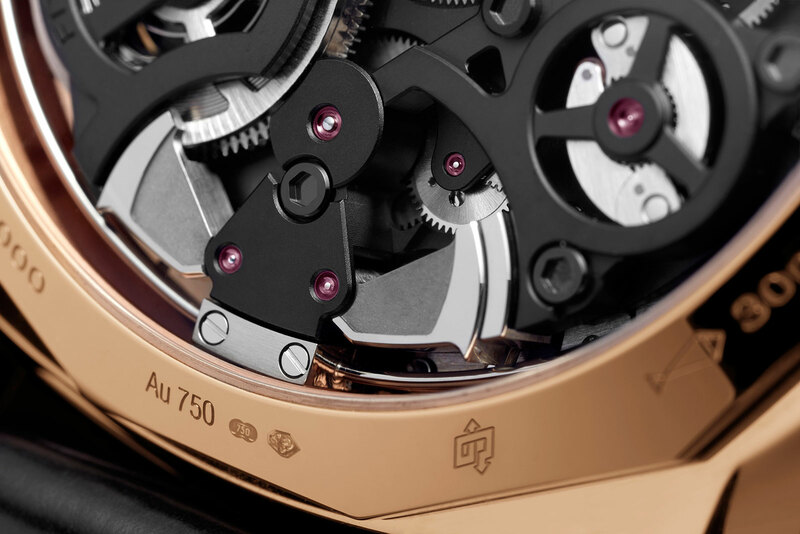 An aperture at 11 o’clock contains the tourbillon regulator that is unusual for both its speed of rotation, 30 seconds instead of the conventional one minute, and its construction. 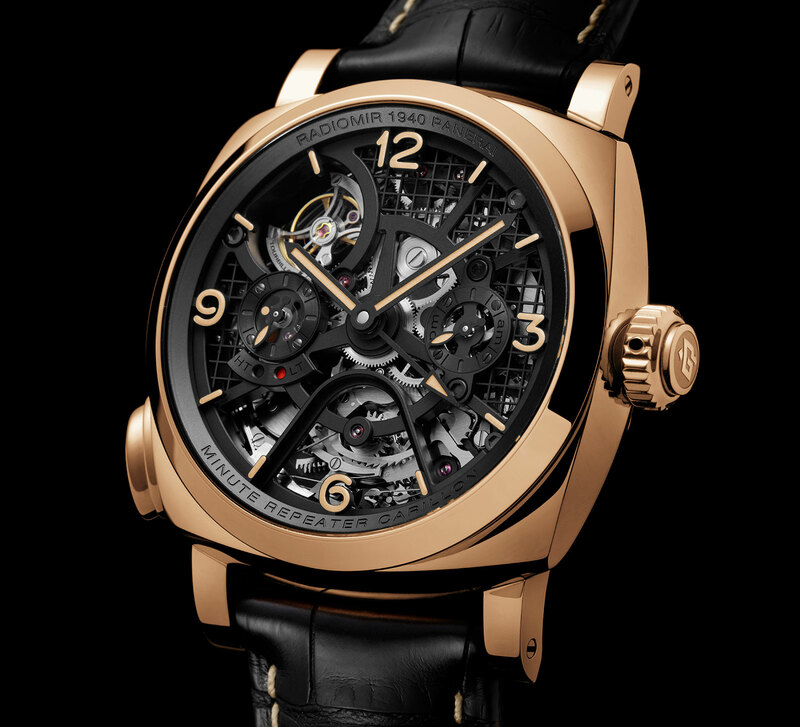 While most tourbillons have the cage rotating parallel to the plane of the dial and balance wheel, the Panerai tourbillon is perpendicular, turning like a spit over a fire. On the back the hammers and gongs of the repeater are visible; the hammers sit at six o’clock while the governor (a device the regulates the speed of the chiming) sits to their right. And the two mainsprings that power the watch are at eight and eleven o’clock, seen through the skeletonised barrels. 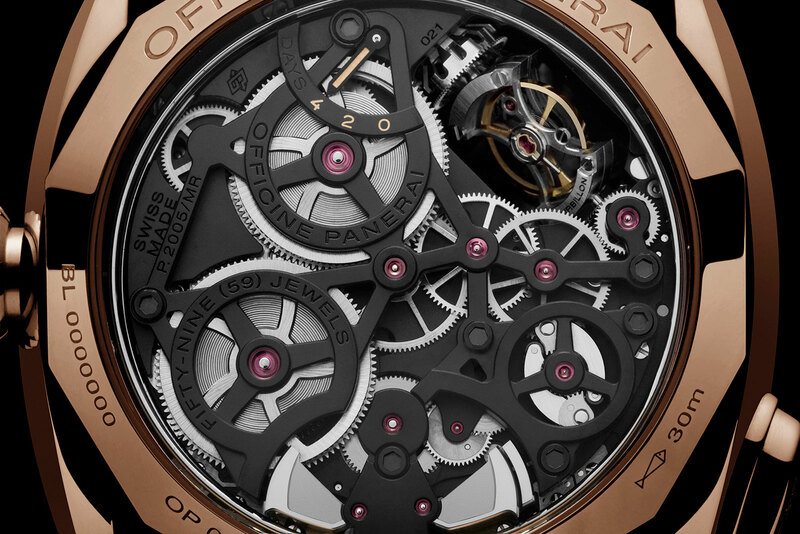 Intriguingly the layout of the repeater mechanism does have a passing similarity to the Rotonde de Cartier Grand Complication; Cartier is of course a sister company of Panerai in Swiss luxury conglomerate Richemont. The Radiomir 1940 Minute Repeater Carillon Tourbillon GMT PAM600 is made to order, with various options for customisation, including the case material, dial colour and hands. It starts at €359,000, or about US$414,000.